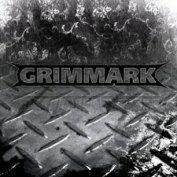 “Grimmark” is the first solo album from Carl Johan Grimmark, a well-known guitarist, composer and producer from Sweden. He’s best known as a band member of Narnia, but he can also be heard on various albums from Rob Rock, Planet Alliance, Saviour Machine, Divinefire, Audiovision, Flagship, Locomotive Breath and Beautiful Sin. With such an impressive record of achievements it doesn’t come as a surpirse to me that this debut solo album is actually a good effort. All nine songs are own compositions and by now Grimmark certainly knows how to write a good melodic metal song. What’s new here, is that we can hear him sing for the first time and he is a great vocalist too. Although the man is a guitarist in the first place, I can’t say that this is a guitar album. 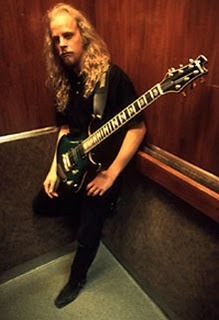 Of course there are some heavy and exceptional solos to be heard, but all of them are there in function of the songs. Eight vocal and one instrumental track (“The New Song”) Assisted by Masterplan’s Jan S Eckert on Bass (on the majority of the tracks) and Amaranthe’s Peter Wildoer on Drums, this is certainly a good effort!! !